Come See CableJive.com’s New Look! On the homepage you’ll now be greeted by big, beautiful rotating images, a new look for our “What Folks are Saying” section, a redesigned Featured Products list, and some other useful links. Most importantly, the left-side navigation is now gone, but that’s only for the homepage. It still appears across the rest of the website. There’s now two giant buttons up top. Simply hover over those and a drop-down menu appears, allowing you to select the device you want to shop for. The “HELP” button (top-right) connects you directly to our support page, where you can get help and send questions to our service team. Additionally, you can find our new alert system at the very top of the page (blue icon, orange text in the picture above). Should we have anything to alert our customers about, we’ll do it there (ie: Free Shipping offers, potential delays due to weather, seasonal promotions, etc). All of our other menu items have been moved to the Footer at the bottom of the page, where you’ll also find nice giant buttons to take you to any of our social media sites, as well as a sign-up form to join our email list right in the Footer (and practically all our emails include some type of coupon, discount, or other way for you to save, so you might want to sign up if you haven’t already). We hope you’ll find our new design as useful as we intended it to be! So please check it out if you haven’t already, and If you have any questions, feedback, or trouble with anything on the website, let us know at www.cablejive.com/service or drop us a line in the comments section below. CableJive has been looking for an inventory management and forecasting solution for a few years now. Back in 2006 when we first started selling cables we could easily keep track of things using a spreadsheet. By 2008 we had added enough new products from a variety of suppliers and manufacturers that it was time for something more. I looked around and couldn’t find what we needed; a simple, powerful inventory tracking and forecasting solution that would easily integrate into an existing business. We didn’t need a full ERP system, our other systems were working well and sufficient for us. We just needed a system that would track our inventory and give us basic reports so we could keep inventory in stock. With no good fit to be found, CableJive developed a homegrown piece of software that integrated very nicely as an add-on to our order management system. Fast forward to 2011, CableJive has continued to grow (yea!) which means more products and suppliers, all handled well by our CableJive inventory add-on. 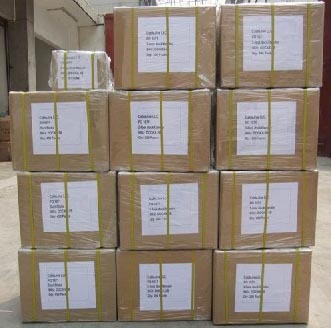 What isn’t handled so well is that we now have multiple warehouses and multiple fulfillment centers shipping orders. We need to know a lot more than just how much inventory is in stock and when to order more. We need to know the overall picture of our inventory, but also how much is at each warehouse and how to allocate new inventory to the various locations in such a way that each one has the right amount to get through until more arrives. We’re in a painful spot trying to manage all of this manually. So we’re in the hunt again for a small business inventory management solution. More details to come on what we’ve found as we’re digging into the options.